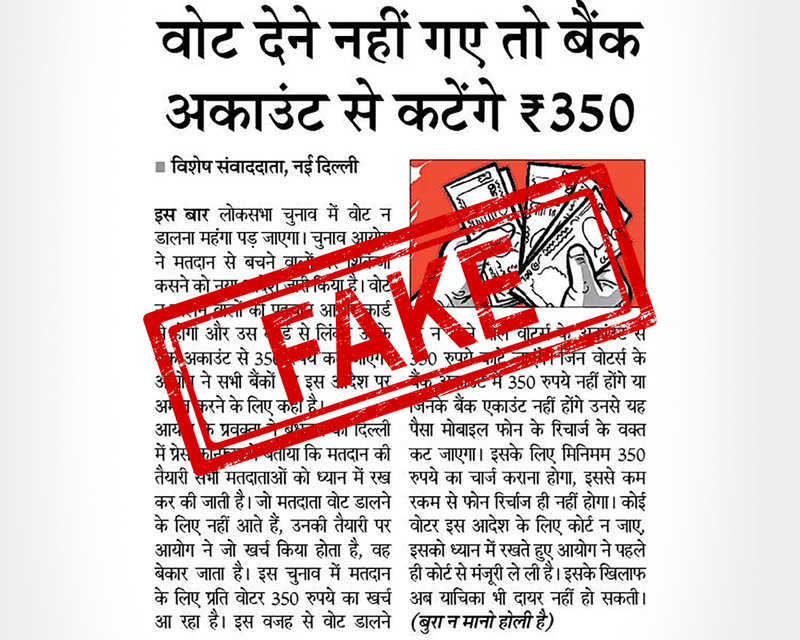 A news clipping from a Hindi newspaper stating that those who do not vote this Lok Sabha Elections 2019 will have to pay Rs 350 as fine, has been going viral on social media. The piece appeared in Navbharat Times' Delhi edition on Holi (March 21, 2019). The article also went on to say that the money would be cut from the voter's bank account. And for those without a bank account, the money would be deducted when they recharge their phone. However, people did not realise it was a satire and perceived what was not intended. The fake news was quick to go viral on social media as people believed it to be true. With India preparing for Lok Sabha polls 2019, readers of the newspaper thought it to be a step by the government to encourage maximum voting. Internet users shared the news widely with their friends, family and relatives telling everyone to vote or otherwise, they will have to pay the fine. Readers of the newspaper failed to see the line of disclaimer at the end of the page which in Hindi reads, "Iss Page ki sabhi khabre aur vigyapan kalpanik hai" (All news articles and advertisements on this page are imaginary). None of the articles on the first page of the newspaper was true, they were simply cooked up ones, meant for light reading. WhatsApp Testing New 'Forwarded' Message Features For Fighting Fake News. Several social media users posted the news clipping on their social media handles informing people about the consequence of not voting this election. Most people appeared to have believed in the fake story which was purely written for entertainment purposes. A disclaimer below the article reads, "Bura na mano, Holi hai" (Don't get offended, It's Holi) clearly indicating the news is not true and only to tickle the funny bone of readers. 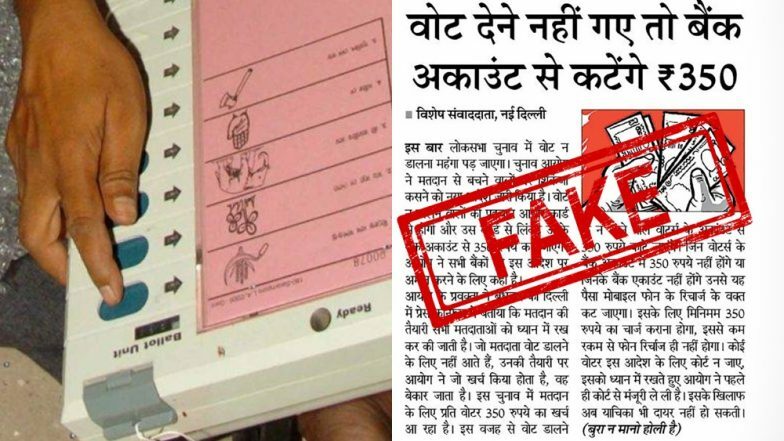 A news piece which appeared in Navbharat Times stated that people who do not vote will be fined Rs 350. However, it was a satire article meant for entertainment purposes which readers mistook to be real.